www.Terrorizer.com - View topic - NECROMANIAC IN CONSPIRACY WITH IRON PEGASUS RECORDS. New song from the forthcoming 7" EP "Subterranean Death Rising" now streaming on Bandcamp. MORBID METAL TO THE DEATH!!!! 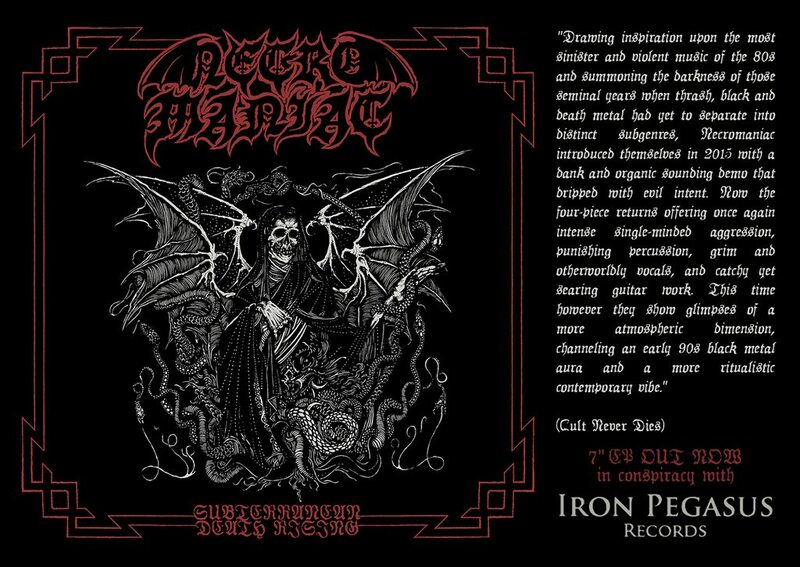 Re: NECROMANIAC IN CONSPIRACY WITH IRON PEGASUS RECORDS. 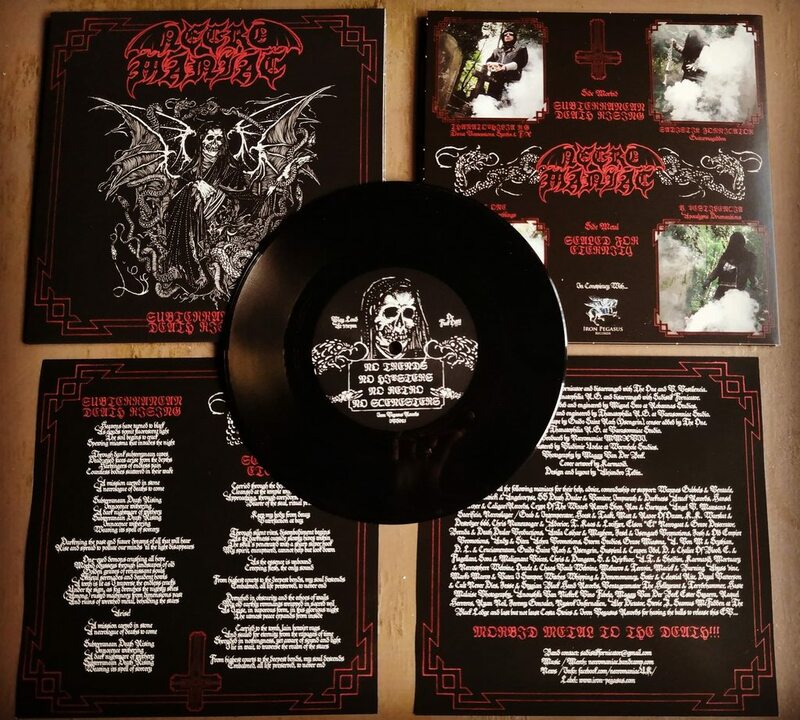 Conceived in the ancient and nefarious streets of London and drawing on the talents of Spanish, Polish and Greek contributors, Necromaniac’s furious and spirited assault is as fresh and vital as it is steeped in history. 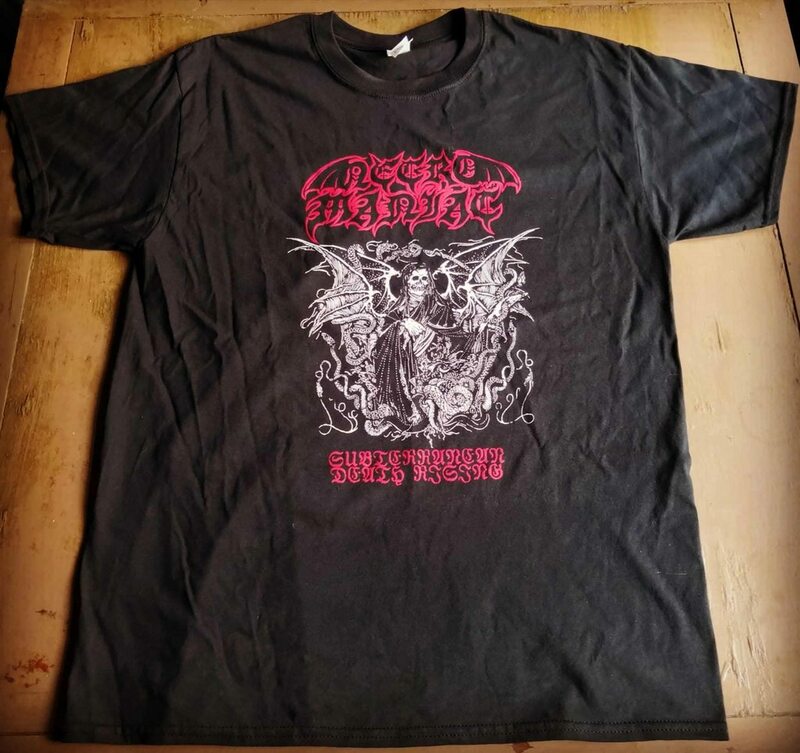 Drawing inspiration upon the most sinister and violent music of the eighties, their songs capture the spirit of those seminal years when thrash, black and death metal had yet to separate into distinct subgenres, while nonetheless never resorting to nostalgia. The band introduced themselves in 2015 via the possessed and riff-packed demo Morbid Metal, an apt title for a release if ever there was one. Demonstrating the benefit of years of collective experience within the scene while somehow always maintaining a primal and hungry edge, the four-piece summoned the darkness of early Slayer, Possessed, Nifelheim, Sodom, Absu, Protector and more with a dank and organic sound that dripped with evil intent. 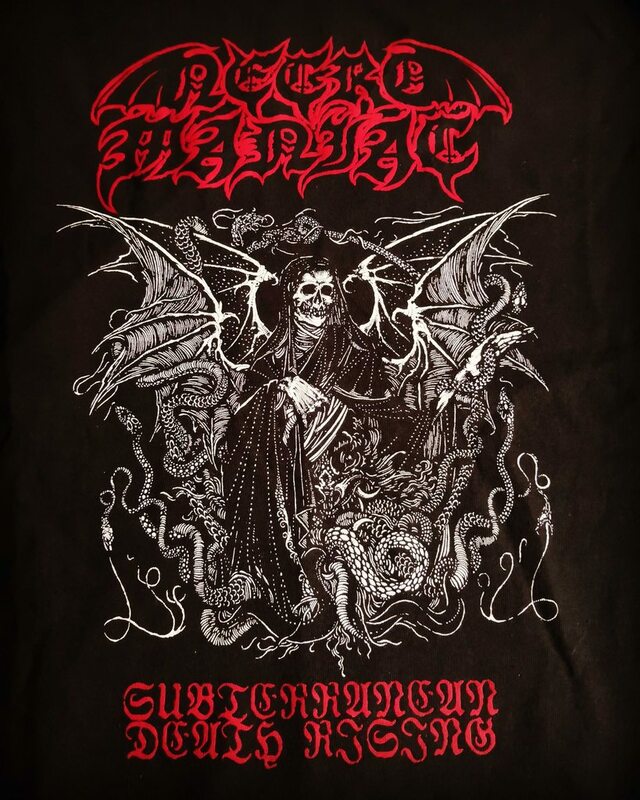 Now Necromaniac returns with a new EP entitled Subterranean Death Rising, issued via respected label Iron Pegasus. Honing their sound slightly while maintaining the raw warmth of their debut, the group once again offer intense single-minded aggression, punishing percussion, grim and otherworldly vocals and catchy yet searing guitar work. 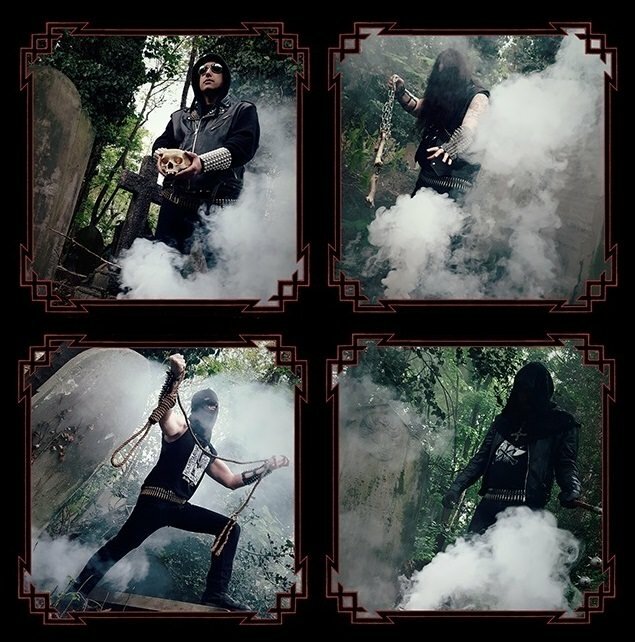 This time however they introduce glimpses of a more considered and atmospheric dimension, channeling an early nineties black metal aura and even a more ritualistic contemporary vibe. Pre-orders now also available from High Roller Records. MORBID METAL TO THE DEATH!!! Clear vinyl completely sold out and we're down to our last copies in red vinyl so act fast while stock lasts! 4-page Necromaniac interview included in the new issue of Oldschool Metal Maniac 'zine. Also featuring interviews with Nifelheim (their 1st interview since 2008!!! ), Deströyer 666, Frank Blackfire (Sodom), Merciless, Voivod, Expulser, Messiah, Holocausto, Force Of Darkness, Matterhorn, and Megathérion among countless others! 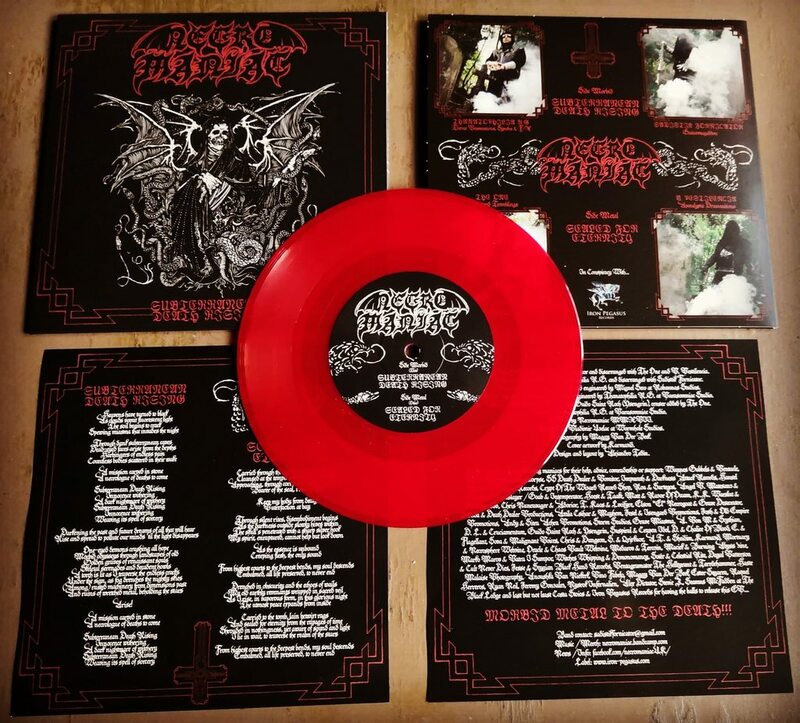 In addition, you'll also find an article about the mighty Morbid plus tons of reviews, live reports and killer Blasphemy, Grave Desecrator, Sadistic Intent, Nifelheim, and Tormentor posters!!! EP review at Occult Black Metal 'Zine, 8.5 out of 10!!! "There is no denying that Necromaniac have created the best record of 2018 up until now through their ability to effortlessly take from such a large diversity of Underground metal and condense it into their own sound and style. Though nothing is new here, Necromaniac have found their own voice in a dead genre swamped with imitators and clowns. Their compositions, playing ability and production style are fully evolved for a band with such little material. 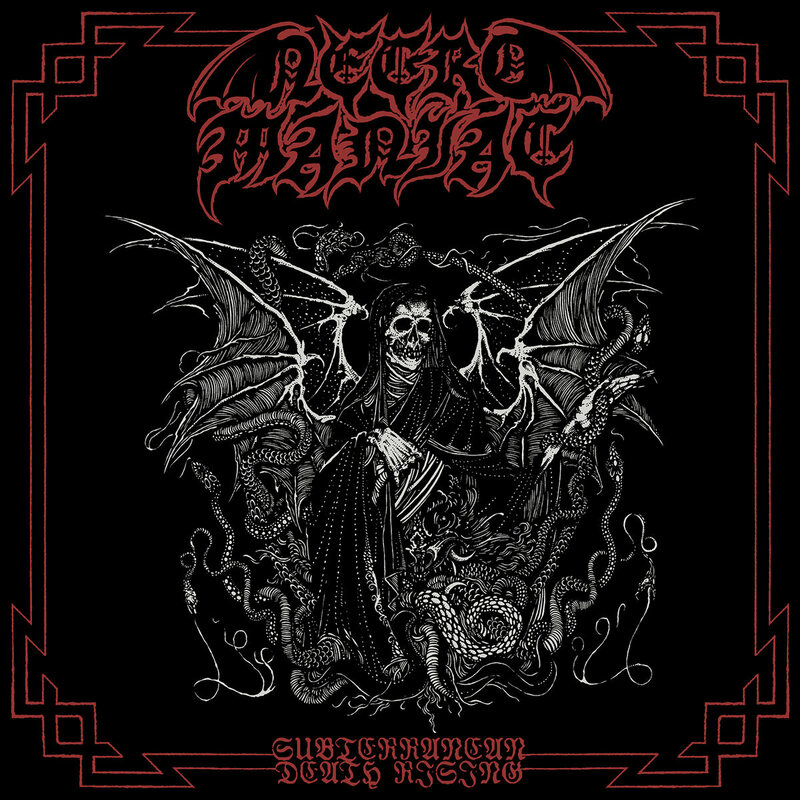 Their first full length should definitely be a truly worthy record, but that would be aiming too low for Necromaniac". Last edited by sadistik fornicator on Wed Nov 07, 2018 4:05 pm, edited 1 time in total. 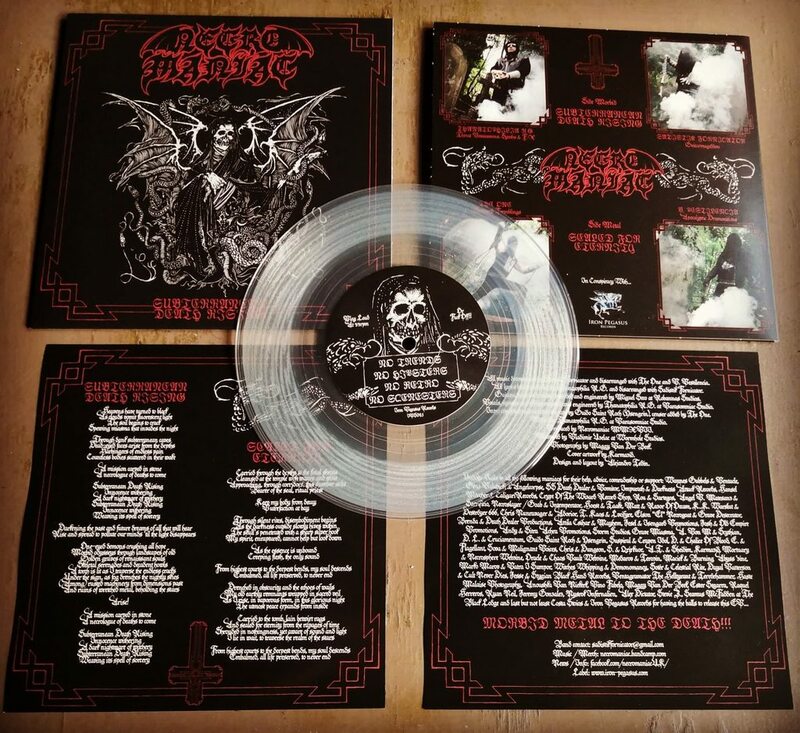 Finnish and Irish maniacs can now purchase Necromaniac's "Subterranean Death Rising" 7" EP from Saturnal Records and Invictus Productions. Support this killer underground labels; they both carry lots of interesting records, tapes, CDs, merch, gig tickets, 'zines and occult books in their webshops (links provided below). 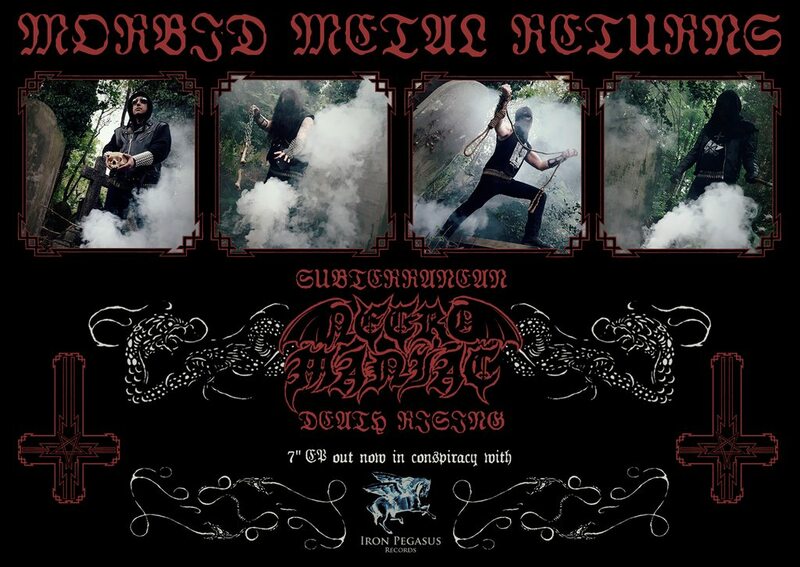 Swedish maniacs can now purchase our 7" EP at Blood Harvest's online store. A few short clips from our live performance in London 3 nights ago.